Architecture is a moveable feast. Ca' d'Oro facade overlooking the Grand Canal. Venetian Gothic is a term given to an architectural style combining use of the Gothic Lancet arch [a type of pointed arch] with Byzantine and Moorish architecture influences. The style originated in 14th century Venice with the confluence of Byzantine styles from Constantinople, Arab influences from Moorish Spain and early Gothic forms from mainland Italy. Chief examples of the style are the Doge’s Palace and the Ca’ d’Oro in Venice. The Gothic period erupted in Venice during a time of great affluence, when the upper class was funding the building of new churches as well as new, opulent homes for themselves. At the same time, monks were beginning to bring the Gothic style to Venice’s churches from mainland Italy. The most striking examples of this new architectural fashion can be seen in Santi Giovanni e Paolo and Santa Maria Gloriosa dei Frari. However, these churches were still very similar to those found in the rest of Italy, the main difference being the building materials. 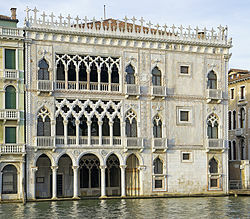 It was not until the increase in palace construction that Venetian Gothic became a distinct style in itself. Influenced by the Doge’s Palace, the creators of this new style meshed Gothic, Byzantine, and Oriental themes to produce a totally unique approach to architecture. This Venetian Gothic style lasted well into the 15th century because of the city’s love of ornate decoration and pointed arches. One major aspect of the Venetian Gothic style change that came about during the 14th and 15th centuries was the proportion of the central hall in secular buildings. This hall, known as the portego, evolved into a long passageway that was often opened by a loggia with Gothic arches. 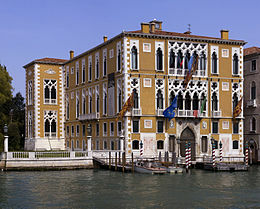 The Palazzo Cavalli-Franchetti is an example of Venetian Gothic architecture. In the 19th century, the writings of John Ruskin and others spurred a Gothic Revival movement in Victorian architecture. A later post will discuss tracery in more detail. This entry was posted in Architecture, Gothic Architecture, Venice and tagged Gothic Architecture, Tracery, Venetian Architecture, Venetian Gothic, Venetian Gothic Architecture, Venice. Bookmark the permalink. Architectural Travels is a comprehensive online resource for travelers with a passion for beautiful buildings. Our objective is to enhance an individual’s travel experience by presenting content that will increase her appreciation and knowledge of the world’s architectural treasures. Please visit some of the fabulous blogs and websites under Links below. Businesses, non-profit groups and individuals may contact me at mariagiannuzzi@att.net. Please visit my LinkedIn profile (Maria Giannuzzi) to see my interesting connections (www.linkedin.com). The beautiful header for this blog is the work of Yumik. His website is www.beckola.com.